Having won 5 Gold Medals already, and fashionably doing so while breaking of the world records associated with each event, here stands Michael Phelps. 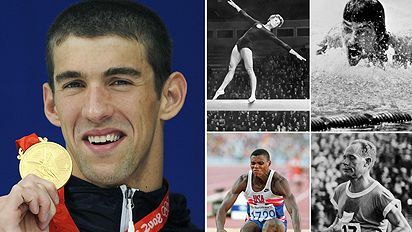 Only 23 years old, and now there is no arguing the fact that he is the single greatest Olympian EVER! He now has 11 Gold Medals, which a chance to end up with 14 after the Olympics in Beijing are over. He is gracious, quiet, not overly cocky, hard-working, likeable, and the list goes on….but the one thing that separates him from the others is the fact that he works harder, swims faster, and continues to crush every competitor and world record standing in front of him……or swimming for that matter. Having a path to constant resources in reference to this is great…. The most accurate phelps reports may take a bit of effort to unearth. This entry was posted on August 13, 2008 at 10:07 am and filed under Sports. You can follow any responses to this entry through the RSS feed.